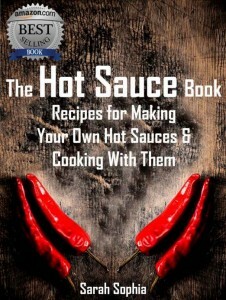 Today’s free Kindle download is a cookbook that will add some heat to your life: The Hot Sauce Book. While it may not bring immediate fire into your love life for Valentine’s day – everyone knows that the way to anyone’s heart is through the belly. If that’s a fire loving belly you are after, you’ll want to make your own sauce. This book will show you how. If you love hot sauce you will love this book. Not only is it packed full of hot sauce recipes, it’s also got alcohol infused sauces, garlic infused sauces and fruity sauces with a hot twist. Learn the techniques behind making world famous sauces and never buy them at the store again. Make your own signature sauces and then follow the simple breakfast, lunch and dinner recipes so that you are never short of meal ideas again. Every recipe is simplified, with all the confusing culinary terms removed, so that anyone can follow along. So get out the peppers, spices and pans because we are going to dive into the world of homemade signature hot sauces. The Hot Sauce Book: Recipes for Making Your Own Hot Sauces and Cooking With Them is available as a free download from Amazon on Thursday, February 13, 2014. It currently has 4.9 out of 5 stars from 16 reviewers on Amazon. For more free eBooks, check out our 10 Websites to Download Free eBooks list, as well as our Free eBook of the Day archive.